Flint came to us from Jim Lock in Essex, England. We had got FC, NAFC Misty Muffet from Jim prior to that time, and had become good friends with him. He called to see if we were interested in Flint - and of course we wanted him. 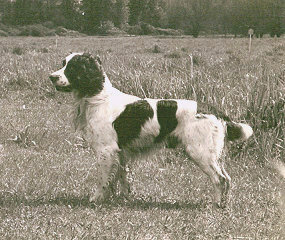 At that time, Flint was close to three years old and he had been running in English trials. Once he got here, it was easy to see why he was not meant to stay in England. He was a big dog, extremely powerful, and needed more room to run than he would have had over there. Jim brought Flint over and stayed for a visit. Unfortunately, Flint came down with kennel cough and we were unable to run him while Jim was here. Finally he got better, and we took him out into the field. My husband, Chris, put down a pigeon. Flint flushed the bird - and chased it - as if he had never been steady a day in his life. We got Flint in the spring and by the following fall he was running well, but he never qualified for the national that year. By the time we went to the national, we knew that we were leaving our best dog at home in the kennel. The next year, 1973, I was judging the Amateur National - so Flint couldn't run in that. We then drove to Arkansas, for the first of two nationals held at Camden. We didn't know what to expect. The training grounds were just terrible, and everybody was anticipating a complete disaster at the trial. "Flint made a situation that would have overcome most dogs look very simple." The grounds included a nursery of fast-growing pine trees for the International Paper Company. The trees were about two to four feet high. One of the lasting memories people have of Flint at that trial was the way he just mowed down these trees. Instead of running around them, he treated them as he would normal cover and ran through them. The trees would be bent down, and then spring back up as the dog passed over them. Bill Goodman commented that Chris was going to get a bill from the company for tree destruction.